Manga series Attack on Titan is phenomenally popular. Based on the story of a group of fighters taking on monsters who invade their land (a sort of giants vs humans tale), Attack on Titan: Wings of Freedom is a re-telling of the first season of the anime which has been made into 2 live action films. 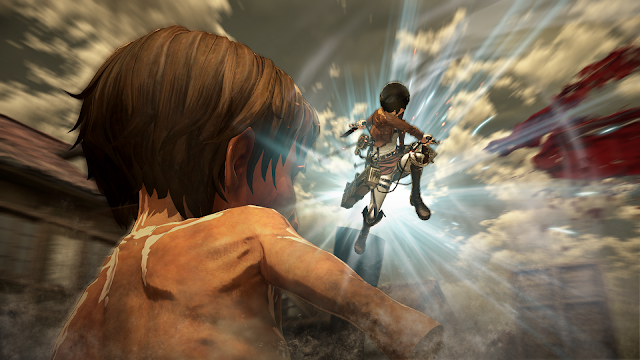 Following the pace and action of the series, Attack on Titan: Wings of Freedom: follows fan favourites Eren, Mikasa as they try to defend their town from the rampaging giants who are determined to break down the walls and bite their heads off. Coming in 3 different sizes and with a couple of different classes, the Titans are a heady and overwhelming bunch to take down initially. Firing Spider-man style metal wires catapults you through the air toward your prey at speed and then once your focus is on certain areas, a perfectly timed pressing of one button will subjugate them and see you scoring points. It's quite difficult to master the controls during the tutorial of the game, but once you find the rhythm it becomes second nature as you flit between Eren and Mikasa on the battlefield with the rest of the 104th battalion whose MO is to defend homes and avenge lost loved ones. Powering up is always recommended as well. Slaying some Titans will see materials dropped and this can help with the upgrades. The Titan-slaying gear; the Omni-Directional Manoeuver Gear, blades, and scabbard can be enhanced at the camp between missions on Single and Multiplayer modes, improving movement speed, blade durability and improved anchors to improve their chances against the Titans. From there, the game is a repetition of battles in different environments as the gang rush to defend bases or each other in the wake of the Titans' attacks. It's eerily addictive once you're into it, and while the Japanese language and English subtitles unfortunately cause a real distraction on screen while you're in the middle of a battle, most of what transpires is beautifully fluid and compulsively easy when you get a rhythm going. Precision is the name of the game - one wrong move can see a Titan grab you in conflict and squeeze the life from you. But equally, when there are several Titans in an attack on screen, the focus can be difficult and often saw Eren attacking the wrong one, meaning conflict was unnecessarily longer than it should be. 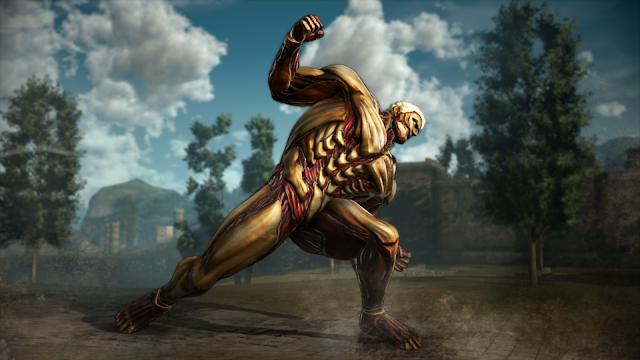 The campaign levels bring a variety that make Attack on Titan Wings of Freedom worth pursuing and some side expedition missions add a frisson of extra short burst thrills. Flying through the air and being covered in Titan blood may sound gory, but this really does capture some of the excitement of the Manga series and may prove a great jumping in point for newbies. 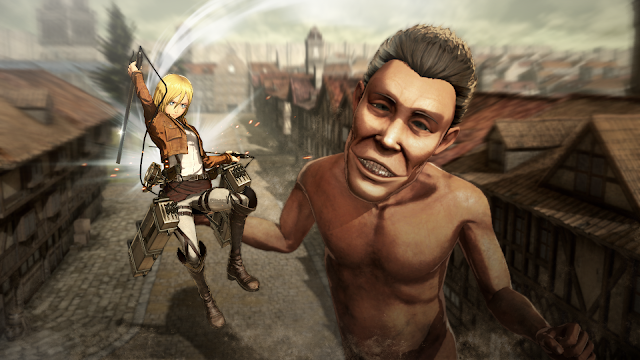 All in all, Attack on Titan: Wings of Freedom is perhaps one of the bigger surprises of the gaming year. It may not be perfect in some ways thanks to occasionally interrupted combat and stilted forced interactions between characters, but when you're soaring through the air in battle, it's thrilling and original.